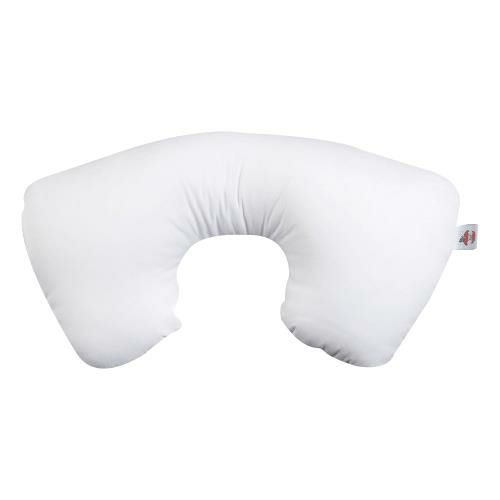 Core Travel Cervical Pillow gives support while sleeping, when traveling or sitting (lobes down with neck in center) or lying down (lobes up or down). It provides the therapeutic comfort of the popular Tri-Core and supports neck to help prevent stiffness from sleeping or sitting. The compact size of the Travel Core Pillow easily fit in suitcase. If sleeping with this under my chin, (backwards) will it hold my jaw "closed" to avoid open mouth breathing? Or do you have a recommendation? Unfortunately we are not medically trained professionals, so I cannot recommend the pillow be used this way. I would suggest speaking with your healthcare professional and seeing if they would suggest doing this. Please let me know if you have any further questions.